Is that you and Cookies? A1 and Cookies…but which is which? Love u A1, say hi to Cookies for me! Unfortunately, this post had to be removed. Unfortunately the cannon bugs out sometimes, and the explosions trigger in the tile of ROSIE, so they blow up right in your face. Is this like Captain Deadbeard’s Cannon Rodeo ability from Plants Vs Zombies Garden Warfare 2? That cannon is actually worth waiting 3 minutes for, IMO. …I wouldn’t mind a ROSIE cooldown reduction hero, though. I saw this post at work before i could watch your new video on blakebeard. At first i thought you stole the joke from this post… Now i see that you are the joker… Jokes on me i suppose. Keep up the great work Aone. You make this game even more entertaining for me, so thank you. 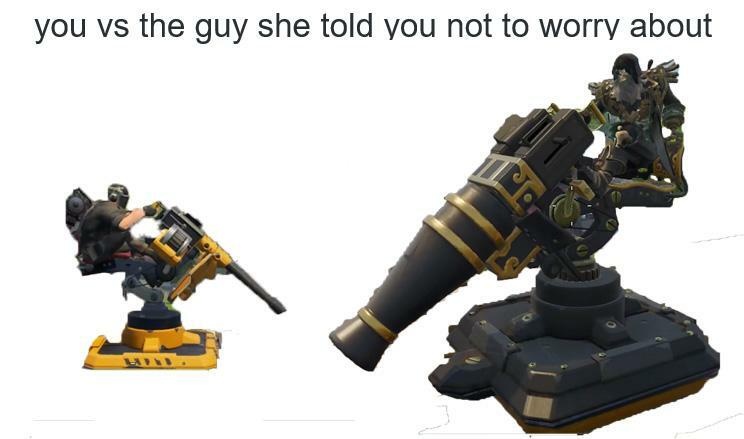 Is that what his turret looks like in game?